Just a quick note to let you know that the first book in my Archer Brothers series is on sale until the end of the month for only $1.99. Four brothers. Four straws. One bride. Now’s the time to see why Short-Straw Bride has garnered over 4,500 five-star ratings on Goodreads! Fall in love with the Archer brothers for only $1.99 for the e-book at all online retailers. 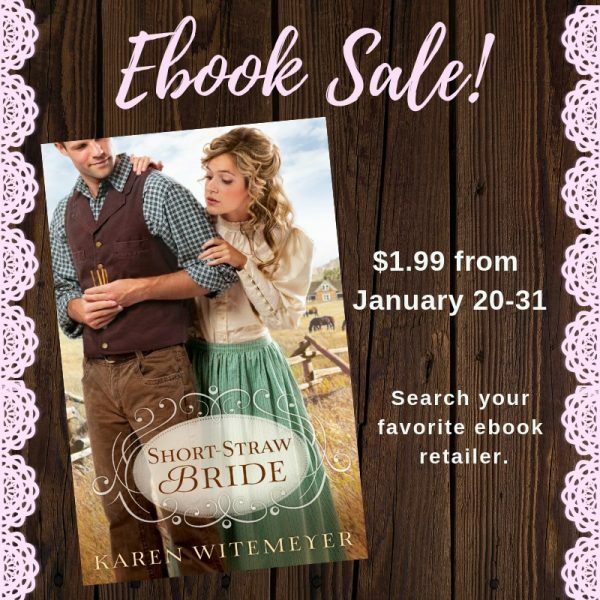 For those who love to smile as they read, bestselling author Karen Witemeyer offers warmhearted historical romance with a flair for humor, feisty heroines, and swoon-worthy Texas heroes. Karen is a firm believer in the power of happy endings. . . and ice cream. She is an avid cross-stitcher, and makes her home in Abilene, TX with her husband and three children. Learn more about Karen and her books at: www.karenwitemeyer.com. This is the first book of Karen’s I read and I just loved it. I highly recommend it. That success is AMAZING, Karen! Congratulations! I’ve ordered my copy and can’t wait to read it! I’d hate to know my husband was my husband because he drew the short straw but I bet it made a heck of a book.